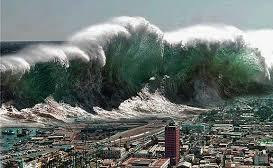 The projected increase in deaths and number of affected from tsunamis globally are likely to increase by 16% in the next 15 years, said a report released by the United Nation Office for Disaster Risk Reduction in New Delhi on Friday. The UN office for disaster risk reduction has called countries around the Indian Ocean, America and Europe to prioritize disaster mitigation policies to reduce tsunami impact as they pose significant threat to "critical infrastructure, including nuclear power plants and airports." The 2004 tsunami had claimed more than 2,26,000 lives in 12 countries, with India accounting for about 16,000 deaths. Indonesia and Sri Lanka were the hardest hit with maximum casualties. The UN report says there were two major tsunamis that occurred in south Asia between 2001 and 2015 impacting four countries in the region with 17.53 lakh people affected and several thousands dead. The report projects that the deaths and affected population would increase by 14% to 19.99 lakh in the next 15 years. Meanwhile, in his message marking the first World Tsunami Awareness Day, United Nations Secretary-General Ban Ki-moon stressed the importance of reducing current and future levels of risk, particularly through strengthening preparedness. "Tsunamis may be rare but, like any other natural hazard, if we fail to prepare and raise awareness, then we risk paying a heavy price," said Ban in his message on the Day. "This should be a clear guiding principle for all those working in the public and private sectors who have to take decisions on major infrastructure projects in seismic zones and near exposed coastlines," he added. World Tsunami Awareness Day, marked on 5 November, commemorates the actions of a Japanese village leader, who on that day in 1854, recognized the signs of an approaching tsunami and set fire to his rice sheaves – an improvised but remarkably effective early warning system – saving the lives of the many villagers who saw the smoke and ran uphill to help put out the flames. In the years since, early warning systems have grown more sophisticated, particularly since the 2004 Indian Ocean tsunami, which claimed nearly 226,000 lives and caused great devastation in many countries of South and South-East Asia. The waves reached as far as South Africa and Yemen. Further highlighting the scale of destruction and human suffering caused by tsunamis, the UN chief noted that since 1996, 250,900 people have died in 21 countries affected by 30 tsunamis. "Tsunamis also pose a significant threat to major infrastructure either already built or planned for coastal areas," he added, recalling the March 2011 Great East Japan Earthquake and Tsunami which killed many people, left thousands more homeless and triggered a meltdown at the Fukushima nuclear power plant. The theme of the 2016 World Tsunami Day is Effective Education and Evacuation Drills. Similarly, in a news release issued by the UN Office on Disaster Risk Reduction (UNISDR), Robert Glasser, the Secretary-General’s Special Representative for Disaster Risk Reduction warned against complacency in confronting the threat of tsunamis. Speaking at the Asian Ministerial Conference on Disaster Risk Reduction, held in New Delhi, India from 2 to 5 November, Glasser underscored that many years of data have shown that devastating tsunamis can impact most regions of the world. "Europe and the Americas are vulnerable as well as the countries surrounding the Indian and Pacific Oceans which have suffered considerably over the last 20 years," he said, referring to a report assessing tsunami hazards over the last 400 years. The report, prepared by Tohoku University, was launched at the Ministerial Conference. The importance of preparedness was also emphasized in the UNISDR study ‘Tsunami Disaster Risk 2016: Past impacts and projections’ which also drew attention to the fact that population growth has greatly increased risk to tsunamis and other hazards in many regions. In December 2015, the UN General Assembly designated 5 November as World Tsunami Awareness Day, calling on all countries, international bodies and civil society to observe the day, in order to raise tsunami awareness and share innovative approaches to risk reduction.